Many of the dinosaur fossils that are displayed in museums come from a relatively small number of places, typically bone beds that have revealed numerous dinosaurs from a small time window in the deep past. One such place is the Cleveland-Lloyd Dinosaur Quarry in central Utah, a gold mine of Late Jurassic dinosaurs with an especially high concentration of predators, particularly Allosaurus. 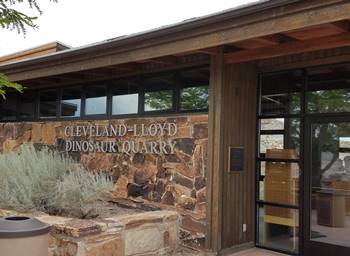 The Cleveland-Lloyd Dinosaur Quarry (CLDQ) is one of the most well-known dinosaur bone sites in the world, and is home to the densest concentration of Jurassic period dinosaur bones ever found. Located about 12 miles from the small town of Cleveland, Utah, the site is a little off the beaten path but paleontologists have been finding their way here since the 1920’s. 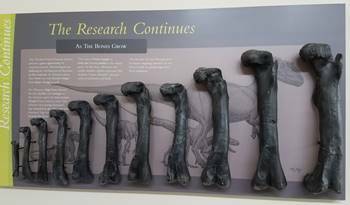 While some bones had been found at the site of the CLDQ before, the first large-scale collection of them occurred in 1927 when representatives from the University of Utah brought hundreds of dinosaur bones back to Salt Lake City. 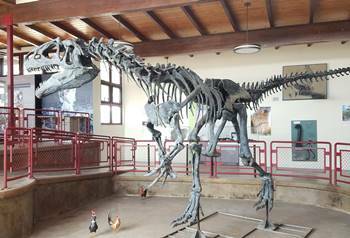 Shortly before the United States entered World War II, a Princeton University team collected most of an Allosaurus skeleton at the site, and the subsequent mount is still on display in a university building back on the Princeton campus in New Jersey. Still, it wasn’t until the early 1960’s that the site became particularly well-known. In 1960 two paleontologists from the University of Utah created the “University of Utah Cooperative Dinosaur Project” which allowed for museums and universities across the world to gain access to fossils from Cleveland-Lloyd in exchange for financial and material support for the paleontological work. 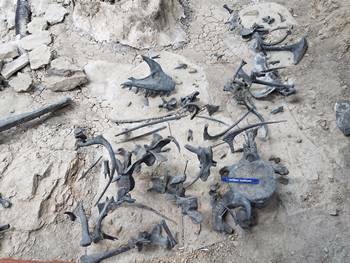 The project revealed a dense collection of Jurassic fossils, including about a dozen distinct dinosaurs. The most common find, by far, has been the apex predator of the Jurassic, the Allosaurus. To date, 46 different specimens of this iconic dinosaur have been identified, many of which are now being displayed in museums throughout the world. If you see an Allosaurus in a museum, there’s a very good chance it came from Cleveland-Lloyd. Approximately 3 out of every 4 Allosaurus specimens on display come from this quarry! If you are going to CLDQ, make sure it is going to be open the day you visit (I made that mistake once). In the past it has been open mostly on weekends during the summer months, but in 2017 it was open every day during that time. Check the website before you go! From the nearest city of Price, Utah, it takes about a half-hour to drive the 20+ miles to the quarry, the last dozen on unpaved, graded roads. The landscape is really interesting; we saw quite a few wild animals on the drive to the quarry, and there is a small lake nearby that had an enormous number of visiting birds on our most recent visit. As you approach the quarry, more and more rock outcrops dot the desert landscape and, before you know it, you will be at the Visitor Center. 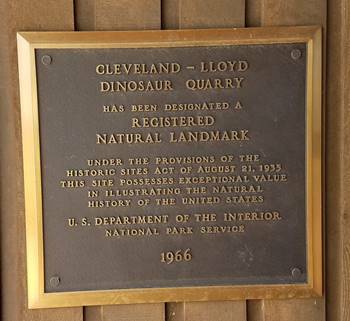 The Cleveland-Lloyd Dinosaur Quarry is run by the Bureau of Land Management, part of the United States Dept. of the Interior, and in 2007, they opened a newly renovated Visitor Center at CLDQ. The fairly large building offers quite a bit to see and do. While I spent time reading many of the signs describing the quarry and its history, my sons worked together on a puzzle which required them to properly assemble an Allosaurus skull. The main attraction in the building is the gorgeous Allosaurus skeleton on display. It is large and menacing, a terrific example of this great dinosaur. Curiously, on the floor around the skeleton are numerous life-size models of chickens. I’m not sure why they are there, but my youngest son loved it and couldn’t stop talking about it. We figured they were there to show how birds, the modern dinosaurs, compared to their ancestors from 150 million years ago. Other highlights in the Visitor Center include some beautiful wall hangings that display 3-D skulls and necks from a few of the dinosaurs found at CLDQ, including Stegosaurus. While the Allosaurus mount is the highlight of the building, there are quite a few other bones on display as well. A display case shows several skulls from dinosaurs found at Cleveland-Lloyd, including the large carnivore Torvosaurus and the smaller carnivore Stokesosaurus. On one wall was a display with the only growth-series of Allosaurus I have seen–this one shows how the femur grew and changed as the animal aged. 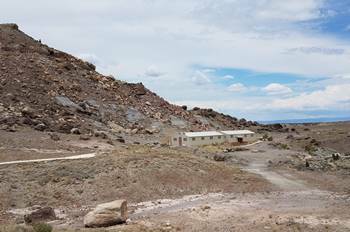 A short hike from the Visitor Center brings guests to the quarry site, which is currently housed in two trailer-sized buildings. When we visited, only one was open to the public. 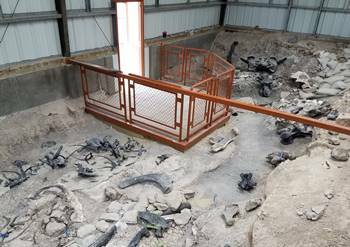 Once inside the building, a small platform allows guests to stand over the quarry site and view the bones, including some still in situ. Although some bones are visible, many of the “bones” are actually casts of bones that have been removed. The majority of the 15,000 or more bones that have come from this famous site are stored at the Natural History Museum of Utah in Salt Lake City. Many others are on display in museums around the world. The display features bones and casts in the original positions they were found. Among the more interesting finds in the quarry was a dinosaur egg that was discovered in 1987. At the time, it was the oldest dinosaur egg ever found. A replica of the egg can be seen at CLDQ. Of the 75 or so individual dinosaurs found in the quarry, almost 2/3 are Allosaurus, and they range from small (3 feet long) to very large (over 35 feet long). The majority are juveniles. Most of the dinosaurs discovered here are carnivores, which leads many to believe that the site was once a deadly predator trap similar in nature to the La Brea Tar Pits. Among the relatively few herbivores discovered at Cleveland-Lloyd are Stegosaurus, Brachiosaurus, Camptosaurus, Haplocanthosaurus, Barosaurus, and Camarasaurus. Because the quarry contains so many predators, for years it has been assumed that it was a predator trap, somehow leading carnivorous dinosaurs to their premature deaths once they became trapped. Paleontologists believe the land was likely a muddy wash near a waterway during the time the animals died. There are several theories about the site, and quite a bit of controversy: was it a predator trap? Why are so many of the dinosaurs Allosaurus? Why are there so few herbivores if it was a feeding site? Did the site sit at the bend of a river that simply accumulated skeletons of animals that died in a flood event and ended up here? Various theories have been posited, and all of them suffer from unanswered questions. This past summer, a new study put the site back in the news. A quick summary of that research can be found at Newsweek: Cleveland Dinosaur Graveyard Mystery. Regardless of how the dinosaurs of CLDQ ended up here, the site is one of the most studied and well-known dinosaur quarries in the world, and it has given dozens of museums some terrific fossils. While I was a little disappointed in the quarry itself since there just weren’t a lot of real bones to see, I had to remind myself that the main reason for their absence is that most of them have been removed and can be found in the great Allosaurus skeletons among the world’s finest natural history museums. Are there other activities available at the quarry site? Besides the Visitor Center and the quarry buildings, there is also a relatively short hiking trail around the park. There are picnic tables as well, but remember to bring your own food and beverages. There are no gas stations or restaurants within at least ten miles, so be prepared. At CLDQ, it is all about the dinosaurs. While the number of real fossil bones in the quarry was somewhat disappointing compared to other sites such as Dinosaur National Park, guests will certainly see real dinosaur bones up close on their visit. One place to see them at Cleveland-Lloyd: the walking path around the park. We noticed quite a few rocks that contained fossilized bones lining the walkways. There is no shortage of dinosaur bones here, and they are easy to pick out with their dark brown color against the light brown mudstone rock encasing them. The Visitor Center has a lot of information about CLDQ, including bone maps of the original quarry and some panels describing various theories about what happened to cause the dense collection of bones. While the information here is good, I think it’s just as good or better at the Natural History Museum of Utah in Salt Lake City; there is a wonderful display featuring several adult and several juvenile Allosaurus attacking a large sauropod, and a large series of panels that describe the mystery at Cleveland-Lloyd. If your travels take you to Salt Lake City, I strongly recommend a trip to that great museum, the displays there really complement the CLDQ. My sons did enjoy our trip to CLDQ. The drive itself was entertaining and fun; we don’t often get to drive so much on unpaved roads. The landscape itself is fairly desolate but has a certain beauty that is mostly unfamiliar to us. While both boys enjoyed the Visitor Center (and particularly the Allosaurus skull puzzle), my youngest son’s favorite part of the trip was seeing (and chasing) the dozen or so small lizards we found on the walkway along the hiking path. 30-40: Excellent, a great place to see dinosaur bones. Strongly recommend! 25-30: Very Good, worth spending some time to see dinosaur bones. 20-25: Good, but will require some effort to see the bones and/or interpret them. Below 20: The dinosaur bones are hard to find and/or see, and there is not much help in the area to guide you. This entry was posted in Allosaurus, bonebeds, dinosaurs and tagged Allosaurus, bonebeds, Cleveland-Lloyd Dinosaur Quarry, dinosaurs, Natural History Museum of Utah. Bookmark the permalink.